My lab studies the molecular evolution of enzymes and metabolic pathways. Metabolic enzymes are superb catalysts, accelerating chemical reactions by up to 20 orders of magnitude. Many, and probably all, also catalyze adventitious secondary reactions due to the highly reactive nature of their active sites. Although these “promiscuous” activities are often inefficient, they provide a repertoire of activities that can be drawn upon if conditions change and catalysis of a secondary reaction becomes important for fitness. Since most bacteria have 1000-2000 enzymes, and each enzyme probably has several promiscuous activities, bacteria can access many thousands of catalytic activities when a new enzyme is needed to enhance fitness or even to enable survival. New enzymes often evolve from promiscuous activities of previously existing enzymes by a process of gene duplication/amplification and divergence. Previous studies of this process have focused solely on mutations in the gene undergoing duplication /amplification and divergence. We are taking a genome-wide approach to studying all of the mutations that contribute to fitness in the face of a novel evolutionary challenge. ArgC (N-acetyl-L-g-glutamylphosphate reductase) is essential for growth of E. coli on glucose because it is required for arginine synthesis. However, a point mutation in proA allows ProA (glutamylphosphate reductase) to serve both functions, albeit poorly. We refer to this enzyme as ProA*. ProA* is the “weak-link” in metabolism; hence, cells are under strong selective pressure to increase its catalytic activity. We evolved eight lineages of a strain lacking ArgC and carrying ProA* under selection for improved synthesis of arginine (Figure 1). As expected, the region surrounding proA* amplifies to several copies. A mutation in proA* was detected only in population 3. In the other populations, we observed genomic mutations that increase arginine synthesis by either pushing or pulling material through the compromised biosynthetic pathway. 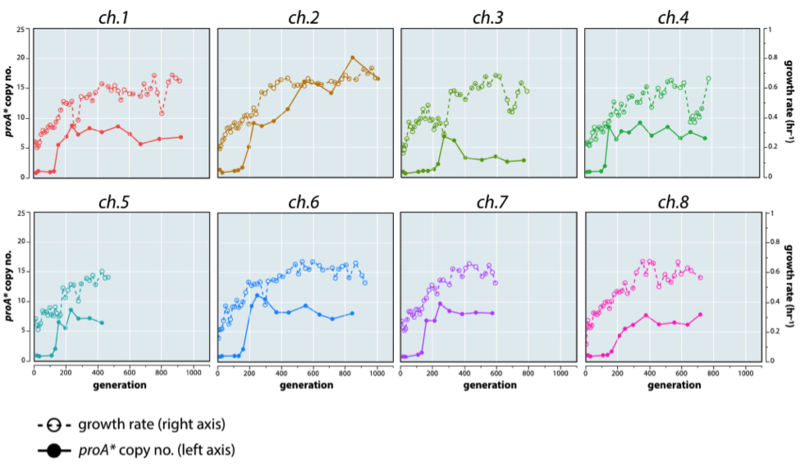 This work demonstrates that evolution of a new enzyme by gene duplication and divergence is inextricably intertwined with genomic mutations that improve fitness by other mechanisms. Promiscuous enzymes can serve as the starting point for evolution of new enzyme activities. However, their evolutionary potential goes further; multiple promiscuous activities can be patched together to generate novel metabolic pathways. We call these pathways “serendipitous” because their assembly relies upon the fortuitous combination of available promiscuous activities, which can differ substantially in different organisms, or in the same organism under different environmental conditions. 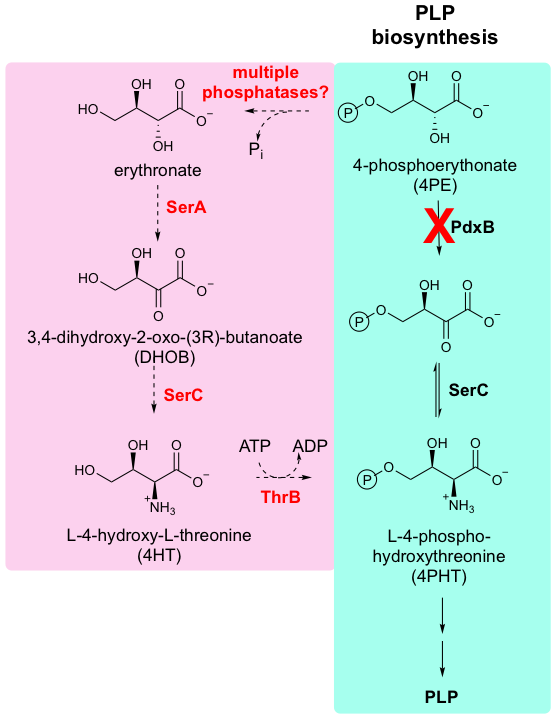 We are studying the emergence of serendipitous pathways in a model system in which we have deleted a gene (pdxB) that is required for synthesis of the essential cofactor pyridoxal 5-phosphate (PLP, a.k.a. vitamin B6). We have succeeded in restoring robust growth of ∆pdxB E. coli within as few as 150 generations by a novel four-step serendipitous pathway. Each step of the serendipitous pathway is catalyzed by a promiscuous enzyme that normally serves another function. This work demonstrates the potential for evolution of novel metabolic pathways that resides within the proteome of a bacterium. We discovered that a strikingly different suite of mutations was found when the same strain was evolved under different environmental conditions, suggesting that either a different solution to the evolutionary challenge was found, or that the same solution emerged but by a different mechanism. Current work addresses how PLP synthesis can be restored in strains evolved under other environmental conditions. A serendipitous pathway (pink) that restores growth of a strain of E. coli that lacks an essential gene (PdxB) in the PLP synthesis pathway (cyan). Red denotes promiscuous functions of enzymes that normally serve other functions.